George’s creams have been carefully researched and formulated and are produced by a single local manufacturer to strict standards. 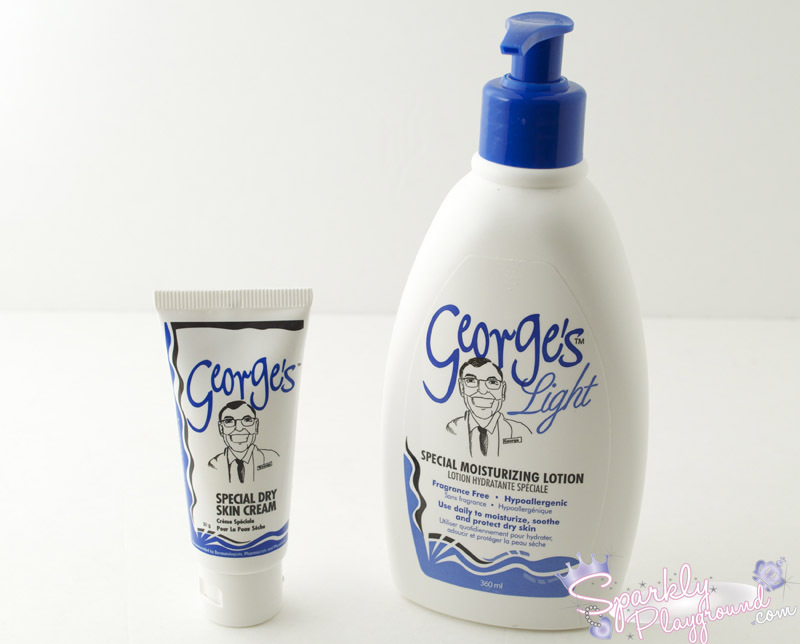 George’s products do not contain urea, lanolin or parabens, and they are hypoallergenic and fragrance free. They are so effective that they are recommended by dermatologists, pharmacists and physicians. Please check their website for more methods and recommendations of uses! Sodium Lauryl Sulphate, Phenoxy Ethanol, Caprylyl Glycol, Sorbic Acid. Ingredients: Deionised Water, White Petrolatum, Glyceryl Stearate & PEG-100 Stearate, Isopropyl Palmitate, Glyceryl Stearate Citrate, Caprylic/Capric Triglyceride, Stearyl Alcohol, Glycerin, Phenoxyethanol & Caprylyl Glycol & Sorbic Acid, Triethanolamine, Carbomer, Tocopherol (Vitamin E). 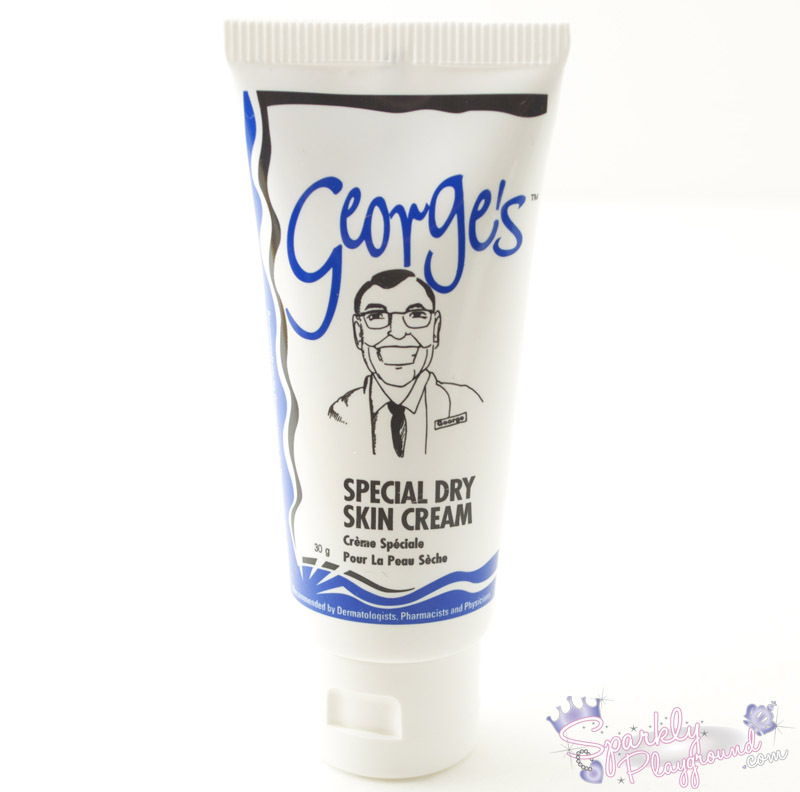 George's Special Dry Skin Cream is available in a 450g jar, 30 ml (the size you see here) and a 90ml tube and has a suggested retail price of $14.99, $2.99 and $6.49. Available across Canada and now available in selected Shoppers Drug Mart and Loblaws! George's is a great Canadian success story and George himself has some interesting stories about how he initially decided to develop a non-prescription cream to help combat severe dry skin for some of his local customers at his pharmacy in Calgary. Using his wife's cake mixer and working on formula after formula in his kitchen - the ultimate result was a cult success for George's Special Dry Skin Cream. The growth, loyalty and demand for the brand has been unbelievable - so much so that Shopper's Drug Mart and Loblaws now carry this brand across Canada. Check out their website, their flash intro is beyond CUTE! COOL RIGHT? I don't think I would be as interested to try this cream without knowing the story to be very honest! I also enjoy these success stories! Anyways, let's start the review! The packaging to me isn't very special but it is practical. I really enjoy the 30ml tube for the dry skin cream, it's perfect to fit in my purse and to use in the office. I don't know why my hands are SO dry at work, maybe it's because the office is especially dry! It's like an instant relief, kinda like my little guilty pleasures at work to have nice moisturized hands :) I'm not sure whether the 450g jar comes with a spatula or not but otherwise I worry about hygiene concerns. I have tried both moisturizers on my body right after shower. The Dry Skin Cream does provide lasting results and I visibly see my skin still moisturized by the time I next shower. The downside is that it takes me a while to massage it all in for my skin to absorb. The Light Moisturizer is quicker for the skin to absorb but I noticed that it does not last all day for me. I am very very very dry though, so this is also something to consider. My body flakes and has "snake patterns" when I don't put cream on after showers. If you're not as dry as me, I think Light Moisturizer is probably going to provide more than enough moisture for you. I'm very very amazed at their How to Use page, I truly recommend you to take a look. I love how detail oriented they are in terms of all the suggestions they give. I have a few friends and cousins who suffers from Eczema, so I'm definitely going to recommend this to them. I also have Swimmer's Itch because I used to be a lifeguard, and this cream proved to me that it has been very very moisturizing.